Director Bimal Roy shot his black-and-white version of Devdas in a fascinating light-and-shade depiction underlining the stark emotional shifts in the lives of his flawed but achingly human characters. Rich with imagery and desperation, this cinematic jewel is also prized thanks to Dilip Kumar's understated performance, as the drunken protagonist, and some poignant acting by its heroines, Vyjayanthimala Bali and Suchitra Sen.
Roy was cinematographer of the earlier, immensely popular Devdas ('35) starring K L Saigal and directed by P C Barua. After Roy established himself as a director post Do Bigha Zameen (1953), he returned to the subject, this time as a director giving his own interpretation to noted litterateur Saratchandra Chatterji's eternal novel. It does seem to be a story that pulls filmmakers towards it repeatedly --- the latest being Sanjay Leela Bhansali, who is currently making his own version starring Shah Rukh Khan, Madhuri Dixit, Aishwarya Rai and Jackie Shroff. A tale that explores some of the outer limits of human experience, from emotions like self-destruction and defiance of society to contempt --- "Ghinn aa rahi hai [I am disgusted]," says Devdas about the sympathetic prostitute Chandramukhi. Devdas (Dilip Kumar) and Paro (Suchitra Sen) are childhood friends who share a volatile relationship. Each is highly egoistic. When Devdas grows up, it is proposed that he marry Paro. But his father turns down the proposal. In one of Hindi cinema's seminal scenes, Paro comes to his house in the middle of the night, suggesting they elope. Devdas, who cannot gather his scattered wits, turns her down. Fate does not give Devdas another chance to undo this dithery decision. An unforgiving Paro rebuffs his overtures and an angry Devdas hits her with a stick, only to then tear a bandage from his own clothes. He is her problem, he is her medicine, too. The resulting scar because of his wound becomes the only tangible motif of their love. Paro gets married to another and Devdas flees to Kolkata. His friend Chunibabu takes him to the kotha [brothel] where he meets Chandramukhi (Vyjayanthimala). Chandramukhi is touched by the fact that he gives money without wanting anything in return. She falls in love with him. But Devdas, even as he unwittingly uses her as an emotional crutch, is unsparing in his rejection of her. "Haath mat lagao, Chandramukhi [Don't touch me, Chandramukhi]," he lashes out when she tries to help him. "Ab bhi kuch hosh baaki hai [I still have my wits around me]." His hopeless passion for Paro sends Devdas down a spiral. Chandramukhi leaves her profession and changes her life. Devdas doesn't have the will to. And though he acknowledges Chandramukhi's place in his life, he cannot offer her any more. He embarks on a train journey around India in a despairing bid to escape from his demons, from his own self. Roy looks at Devdas with great sympathy. It is also a story about the two women in his life who emerge stronger than him. 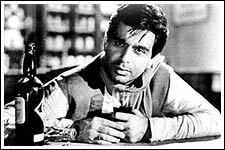 Dilip Kumar physical traits as a drunk --- the way he blinks as though trying to clear the mists from his mind -- are realistic so are his eloquent silences. Suchitra Sen is just right as Paro. She brings Paro's egoism a defiance and self-respect. Vyjayanthimala imbues Chandramukhi with true sympathy. Who better than Chandramukhi would know the pain of a hopeless love? Dilip was an established star at the time. Devdas was one more tragic role for the actor. In fact, he had to consult a psychoanalyst to help him deal with the aftermath of these roles. Vyjayanthimala, a star after the blockbuster Nagin, still had to establish her acting credentials when Roy went against the tide and cast her in the role of Chandramukhi. It was Bengali cinema's foremost female star Suchitra Sen's first Hindi film. She won wide acclaim but the picky actress did only a few roles subsequently (Bombay Ka Babu, Mamta, Aandhi). Devdas won Dilip Kumar the Best Actor trophy and a Best Supporting Actress award for Vyjayanthimala, which she was miffed about. She was vindicated when Bimal Roy cast her in the title role of his next production, Madhumati. Chandramukhi: "Aur mat peeyo Devdas. Itna zyaada bardaasht na kar sakoge [Don't drink any more, Devdas. You will not be able to handle it]." Devdas: "Kaun kambakht bardasht karne ke liye peeta hai [Which sod drinks to handle himself?]" Composer S D Burman and lyricist Sahir Ludhianvi didn't have a Saigal but still came up with a memorable score for the film. Paro doesn't sing a single song. But there are two Baul songs picturised on her --- Geeta Dutt-Manna Dey's Sajan ki ho gayee and the eternally beautiful Aan milo Shyam saawre where a little Suchitra misses a young Devdas. Talat Mehmood's Mitwa is haunting. Danseuse Chandramukhi has the best romantic numbers: Mubarak Begum's Woh na aayenge palatke, unhein lakh hum bulayein, Lata's two mujras --- Ab aage teri marzi and O jaanewale ruk jaa thodi dum. Lata's plaintive Jise tu kabool kar le woh ada kahan se laoon serves well as Chandramukhi's signature tune.